The commission said this on its officialFacebook page while reacting to its victory against ex-Finbak boss, Nwosu, who failed to stop his trial at the Supreme Court last week. The Central Bank of Nigeria, under the leadership of Mallam Lamido Sanusi (now Emir of Kano), had, in 2009, petitioned the EFCC, asking the anti-graft agency to investigate Nwosu, Akingbola, Atuche and a former MD of the defunct Oceanic Bank, Mrs. Cecilia Ibru, who has since been convicted. Based on its findings, the EFCC charged them before the Federal High Court, Lagos, on money laundering charges. It subsequently initiated another charge of stealing against them before a Lagos High Court, Ikeja, having obtained a fiat from the Lagos State Attorney General. Nwosu, however, challenged the charge at the Lagos High Court on the grounds that it was an abuse of court process and would expose him to double jeopardy. He also questioned the jurisdiction of the state High Court. The Lagos High Court dismissed his objection. Nwosu then took the matter to the Court of Appeal, Lagos division and won in November 21, 2014. 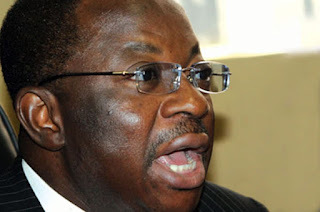 Subsequently, both Akingbola and Atuche argued that since their cases were identical with that of Nwosu, the charges against them should be struck out on the same grounds. The Court of Appeal therefore struck out the charges against them on the same grounds. In a last attempt, the EFCC took Nwosu’s matter to the Supreme Court and was handed a victory last week. The Supreme Court, in its judgment, upheld the appeal by the EFCC and set aside the decision of the Court of Appeal, Lagos Division, which earlier quashed the charge on the grounds that it amounted to an abuse of court process. The court, in a unanimous judgment of a seven-man panel, faulted the reasoning of the Court of Appeal in relation to its finding that the decision by the EFCC to charge Nwosu and directors in his bank for stealing before the Lagos High Court, while it simultaneously maintained a charge of money laundering against them on related facts, would expose them to double jeopardy. The court directed Nwosu and directors in his bank to submit themselves for trail and remitted the case back to the Lagos State Chief Judge for expeditious trial. In the lead judgment on the appeal SC/74/2014, which was used to decide two other appeals (marked: SC/73/2014 and SC/75/2014) on similar issues, Justice Musa Muhammad held that it was unreasonable to suggest that the prosecution of the respondents by the appellant at the trial court was aimed at either irritating or annoying them or was a bid by the prosecution to stall the effective and efficient administration of justice. Last week, Justice Muhammad, in the lead judgment of the Supreme Court, held, “Besides, the offence of stealing as created by the Lagos State House of Assembly, notwithstanding the same or similar facts as constituted under other offences created by the National Assembly, retains its identity as being not only dissimilar, but distinctively different. The court further held that the rule of double jeopardy, as contained in Section 36(9) of the1999 Constitution, could not avail for the respondents, having been unable to prove that they were being prosecuted for the same or substantially the same offence at the Lagos High Court and the Federal High Court. “Accordingly, this meritorious appeal is allowed, and the perverse judgment of the lower court is set aside. The decision of the trial court in consequence, prevails,” it said. Justices Walter Samuel Onnoghen, Olabode Rhodes-Vivour, Nwali Sylvester Ngwuta, Clara Bata Ogunbiyi, Chima Centus Nweze and Amiru Sanusi agreed with the lead judgment. The EFCC hailed the judgment of the Supreme Court, describing it as a victory in its fight against corruption. It said, “The EFCC has won a major victory in the war against economic and financial crimes as the Supreme Court categorically ruled that Okey Nwosu, former Managing Director of FinBank Plc, who is being prosecuted by the EFCC over N18bn shares scam, should face his trial.